October 4, 2015 December 6, 2015 | C.S. Young Jr. Within the next generation or two, these old farms will be mostly lost. Not more than two generations ago, there were operational farms everywhere. Similar to the loss of small main street businesses to mega mass-merchants, family farms have lost ground to agricultural giants. Over the past few years global food security has risen as an important topic for policy planners. Current large scale operations are simply not sustainable and like the images in this post, they may someday be subjects of abandonment. With growing interest in sustainability and locally grown produce, perhaps we’ll see these beautiful structures one day return to the countryside. 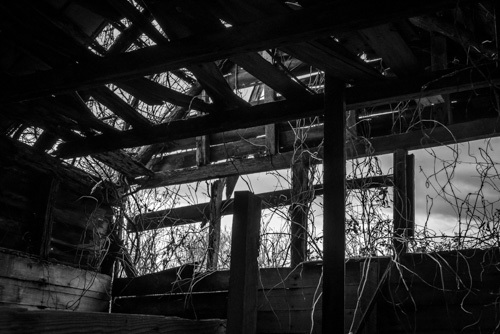 The images in this post were from an abandoned farm in Ruffin, North Carolina, between Reidsville and Yanceyville on Hwy 158 in Caswell County. This past July, I noticed the farm while my Scout Troop was traveling to Cherokee Scout Camp near Yanceyville. The following weekend I stopped on the way back from camp to capture these images. The morning sun was peaking in and out of the clouds, creating ideal lighting conditions for the contrasty white barn and wood shed. Another interesting characteristic of this barn was the dead vines still clinging to sides, you can see where they had been cut away from the ground. Vines are the first phase of Mother Nature’s reclamation of man made creations. Perhaps this was an earlier intervention intended to slow that process. All the images in this series were processed in Lightroom and Photoshop, and finished with Alien Skin’s Exposure 7 to emulate Agfa black & white film. June 4, 2015 | C.S. Young Jr.
Last weekend the Carolina sky was full of big, thick cumulus clouds. After an errand at the local farmer’s market I headed into the country side just north of Colfax. After driving around for a while, I found this big open field with an old horse shed and large open sky behind ― Shed, Field, Clouds. The midday sun put much of the barn’s front facade in a deep shadow, which helped create additional contrast with the field of grass and sky. In addition to the beautiful clouds, I like how the light shaded plant in front of the barn is echoed in reverse by the trees on the ridgeline. I used my current Agfa APX 100 goto filter for post processing photos in black & white. The grain structure in this filter gives a subtle, fine grain look and a nice gentle boost in contrast. In an earlier trip through Colfax, I drove by a tin covered barn with red painted wooden doors. On several occasions, I’ve thought about returning to take pictures. Well finally I visited the location and was able to compose a strong graphical composition in black & white with the color left in on the red door. I used the same Agfa post processing filter on Red Wooden Door on a Tin Barn. Clicking on an image will take you to a higher resolution version on the image on my portfolio site. February 17, 2015 May 8, 2015 | C.S. Young Jr.
For months I’ve admired the old Willard Dairy Farm in High Point, NC as I drove past it on the road that bares the same name. A prominently displayed No Trespassing sign had dashed my hopes of exploring this property with my camera. That is until a few weeks ago when several Boy Scouts from my Troop and I were picking up trash as part of a service project on Willard Dairy Farm Rd. About an hour later at the other end of the road, we came by a small farm operation. I asked some young workers loading feed into a truck about who owned the abandoned farm down the road. The workers directed me to a man in an old pickup; I walked over an introduced myself. Why it was 87 year old Mr. Willard, his father had purchased the 100+ acre property in 1912 to established a dairy farm. He informed me his family no longer owned the site of the original farm, but he thought it would be ok for me to take some photos. So last weekend, I finally drove by and took some pictures just before the late day light began to fade. The first image, Inside Out, is from inside a small shed next to main barn & silo complex. The building has been decaying and taken over my vines. Stepping into the shed side entrance, I noticed missing wood on the sides and roof, which was allowing indirect light from the overcast sky. The compressed dynamic range allowed me to capture a dramatic image of the overcast sky while preserving some of the shed interior detail. Of course, the photo needed some processing in Lightroom to hold a suitable amount of shadow detail while at the same time pushing for a little extra contrast. To finish the image, I used a filter in Exposure 7 to emulate Plux-X black & white film. It may be trivial, but I think its pretty cool how the vines are reverse silhouetted against the sky versus the darken wood. 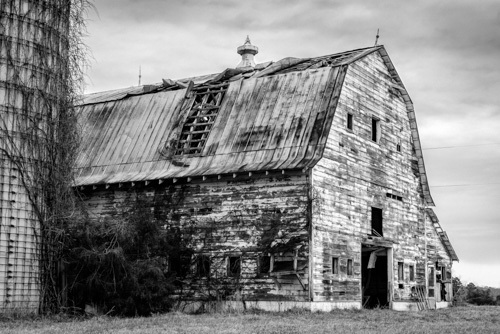 The next Willard Farm Barn Facade image features the dramatic character of the deteriorating old Willard barn. On my portfolio site, I talk about “The Beauty of Decay“. There is an interesting juxtaposition between the rich textures, colors and character of natural decay on the one hand, with the sense of nostalgia for antique artifacts. At first I was concerned about the flat overcast lighting, but was able to put some depth and shape back in the image during processing. This time I went back to finishing up with a Panatomic-X filter, this time though with less push processing to maintain contrast while achieving grain structure and other film characteristics. Please leave a comment with your thoughts, feelings, feedback, advice or whatever else these images may bring to light. It’s often said, the simple things in life turn out to be the most meaningful. Perhaps it’s not to much of a stretch to think about the beauty and visual interest to be found in a closeup of an old barn. Yes, beauty is in the eye of the beholder; but for me, the rich textures of the weathered barn wood and rusted tin make for a splendid composition. How often do we miss opportunities to seek-out and appreciate the beauty found all around us? Each time I process an image in Lightroom, I’m still amazed how just the right combination of adjustments can “make and average photo good, and good photo great”. 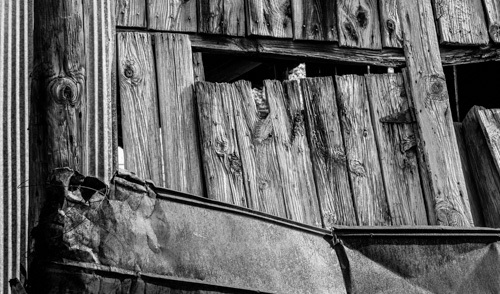 In this Barn Wood & Tin Composition image however, I did end up experimenting for quite a while with the Clarity, Tone Curve (contrast) and Color Luminance adjustments to get just the right tonality character. Specifically reducing the luminance for red, along with some additional burning resulted in a satisfying texture on the piece of tin at the bottom of the image. I used my usual Panatomic-X processing filter to get a little extra snap and analog grain in the image. During the processing of this image in Lightroom, I felt a sense of anticipation & excitement as the final image began to reveal itself. I was reminded of my years in a real Darkroom and the same feeling of anticipation as the image first reveal its prescribed potential when hanging up the role of film to dry after development. And, later at the enlarger making decisions about dodging and burning, followed by the emergence of a final image as the photo-paper made its way through the trays of chemicals. Things change over time, and yet in many ways, they stay the same (pardon the cliché).